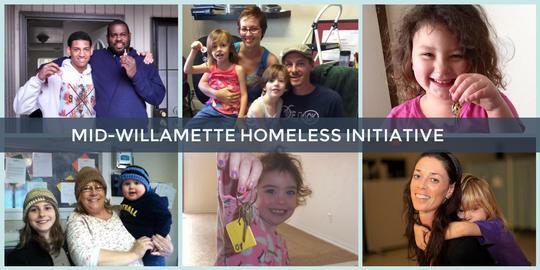 Welcome to our inaugural edition of the Mid-Willamette Homeless Initiative e-newsletter. We will provide regular updates to keep you informed and engaged in this important work in our community. You may manage your subscription at any time by updating your subscriber preferences. In his February State of the City address, Salem Mayor Chuck Bennett announced the initiation of a Housing Rental Assistance Program to provide permanent housing for Salem’s homeless population. According to Mayor Bennett, the program is targeted toward finding housing for the estimated 500 hard-to-house people among the city's homeless population. "These are the homeless that we most commonly see sleeping on sidewalks, park benches, in parks, and under bridges," Mayor Bennett said. The initial launch of Housing Rental Assistance Program (HRAP) includes a one-year plan to house 100 of the highest-needs homeless individuals, using Section 8 vouchers set aside for this purpose by Salem Housing Authority. In addition, the City of Salem is considering in its 2017-18 budget targeting $1.4 million to provide other supports, such as security deposits, fees for identification, and credit supports. The HRAP program plans to follow a family self-sufficiency model, equipping individuals with skills to attain greater independence. Salem Housing Authority will dedicate staff to HRAP and is conducting outreach to landlords to secure units where the vouchers can be used. According to Andy Wilch, Salem Housing Authority administrator, the partnerships with local service providers will be the backbone of HRAP and vital to its success. As a part of the evolving effort to advance homeless services in the Mid-Willamette Valley, a new Coordinated Entry System (CES) has been launched in Marion and Polk counties. CES is a model endorsed by HUD which involves ongoing collaboration among regional housing and homeless service partners to strategically address homelessness. The initial meeting was spearheaded by Jimmy Jones, Community Resource Programs Director, Mid-Willamette Valley Community Action Agency, and was well-attended by a number of local partners. As explained by Jones, CES systems are made successful by their low-barrier approach of providing fair and equal access to housing and necessary supports. 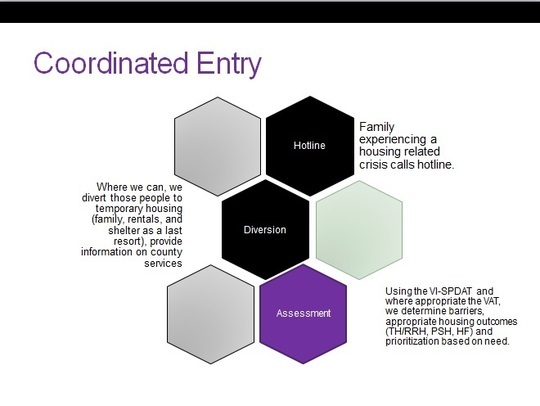 Individuals who are homeless undergo a standardized assessment and their level of need is quantified through a vulnerability score, which is used identify which type of housing is most appropriate for each individual. The system of prioritization is a shift from a traditional first come, first served model and seeks to rapidly provide housing to those who need it most urgently. One of the initial efforts of the CES is to partner with the City of Salem’s new Housing Rental Assistance Program, identifying 100 of Salem’s most vulnerable homeless persons for placement in permanent housing. 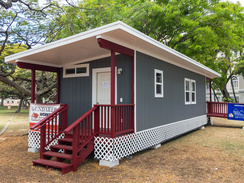 Accessory Dwelling Units (ADUs) have been used throughout the nation as a creative strategy to increase housing supply. Several efforts have been underway at the state and local levels to facilitate ADU construction. One such effort was Senate Bill 1024, considered in the current legislative session, which would have allowed for ADUs to be built on properties zoned as Rural Residential. While this bill did not move forward, House Bill 2007, which would make it easier to build ADUs in urban areas by limiting lengthy administrative approval processes, has been referred to the Joint Committee on Ways and Means. At the local level, Marion County and the cities of Keizer and Salem have been working on ADU codes. In April, the Salem Planning Commission recommended that the city council allow ADUs, addressing issues such as size, height, setbacks and short-term rentals. The commission’s recommendations can be found on the City of Salem website. Public testimony was received at the June 12 city council meeting, where a number of people testified in support of allowing ADUs. However, concerns around parking space requirements, manufactured homes, and short-term rentals were highlighted by members of the public. The issue will be discussed again on June 26, 5:30 p.m., at the Salem Civic Center, 555 Liberty Street SE, in Salem. The Marion County Planning Commission has also been working on recommendations for the county to allow ADUs in unincorporated portions of Marion County that are also within urban growth boundaries, which would include unincorporated East Salem. The planning commission will hold a hearing to receive testimony on August 1 at 6:30 p.m. in the Senator Hearing Room at Courthouse Square, 555 Court Street NE, in Salem. The board will then hold its own hearing in the fall to consider the planning commission’s recommendations. After many years of planning, downtown Salem is primed to see a new sobering center become a reality in the upcoming months. The City of Salem is leading the effort, in collaboration with Marion County and Salem Health. The sobering center will help to ease the burden on law enforcement and emergency services personnel, who have limited options outside hospital emergency departments or the county jail for persons who are acutely intoxicated. With the passage of House Bill 2175, which removes the cap on the number of sobering facilities that can be registered in Oregon, the door has been opened for such a facility in Salem. State law allows police and emergency personnel to admit an acutely intoxicated person to a sobering center for a 24-hour stay, where they will be safely supervised and linked to treatment services upon discharge. State law established by House Bill 2936 (2015) sets criteria for sobering facilities. The facility must provide acutely intoxicated individuals with a safe, clean and supervised environment until the individuals are no longer intoxicated. The facility also must contract with or be affiliated with an addiction treatment program or provider for case consultation, training and advice, and a plan for making referrals to addiction treatment. Finally, the facility must adopt comprehensive written policies and procedures to assure safety for the intoxicated individuals, staff and volunteers. When sobering centers meet these criteria and are registered with the Oregon Health Authority, facility staff is protected from criminal or civil liability provided that their actions are in good faith and without gross negligence. Additionally, House Bill 2176 allows Oregon counties to use drug and alcohol funds for sobering center operations. When the Mid-Willamette Homeless Initiative Task Force concluded its work last February, the task force authorized a transition team to move the initiative to implementation. That team has been meeting at the Mid-Willamette Valley Council of Governments’ offices. The focus has been to lay the foundation for a program manager position, which will coordinate strategic plan implementation moving forward. Transition team participants have reviewed an initial draft of a job description and engaged in a discussion to confirm which organization is best equipped to house the position. Although the Council of Governments or COG was identified early on as the likely contender, due to its neutrality and integrated work among multiple jurisdictions, participants also entertained the possibility of other local organizations that may be suited for the work. Ultimately, the group agreed that the COG was uniquely suited and most qualified to house the position. COG President Sean O’Day will provide an update at the June board meeting. The next step is to develop an intergovernmental agreement among participating jurisdictions. The group has also discussed potential candidates for a policy team that would guide the initiative’s continued work. For more information about the Mid-Willamette Homeless Initiative, contact: Hitesh Parekh, Marion County, at hparekh@co.marion.or.us or visit our website at www.homelesstaskforce.net.